• Do not put anything near the buckle. Placing objects near the buckle can adversely affect the buckle pre-tensioner and may increase the risk of personal injury in the event of a collision. • For your safety, be sure that the belt webbing is not loose or twisted and always sit properly on your seat. 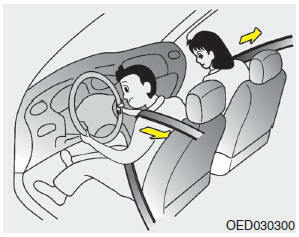 • Both the driver's and front passenger's pre-tensioner seat belts may be activated in certain frontal collisions (or side collisions). 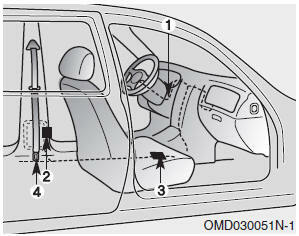 The pre-tensioners will not be activated if the seat belts are not being worn at the time of the collision. • Although it is harmless, the fine dust may cause skin irritation and should not be breathed for prolonged periods. Wash all exposed skin areas thoroughly after an accident in which the pretensioner seat belts were activated. • Because the sensor that activates the SRS air bag is connected with the pretensioner seat belt, the SRS air bag warning light on the instrument panel will illuminate for approximately 6 seconds after the ignition switch has been turned to the ON position, and then it should turn off.